For those who know Flora, an introduction is unnecessary. Her music has interwoven the life fabric of anyone with a passing interest in Latin and American jazz music for over 25 years. Her once-in-a-generation six-octave voice has earned her two Grammy nominations for Best Female Jazz Performance and Downbeat magazines Best Female Singer accolade on four occasions. Her musical partners have included Gil Evans, Stan Getz, Chick Corea, Dizzy Gillespie and Airto Moreira, with whom she has collaborated on over 30 albums since moving with him from her native Rio to New York in 1967. Her musical genius was inbred thanks to a Russian émigré father who played violin and a mother who was a talented pianist in her own right. Before leaving Brazil to escape the repressive military regime of the time, she had mastered piano and guitar and liberated an exhilarating vocal talent. In New York, she and Airto became central to the period of musical expression and creativity, which produced the first commercially successful Electric Jazz groups of the 70s. Blue Note artist Duke Pearson was the first American musician to invite Flora to sing alongside him on stage and on record. She then toured with Gil Evans about whom she says, this guy has changed my life. He gave us a lot of support to do the craziest stuff. This was the beginning for me. Her reputation as an outstanding performer gained her work with Chick Corea and Stan Getz as part of the New Jazz movement that also contained the nurturing influence of sax man Cannonball Adderley. 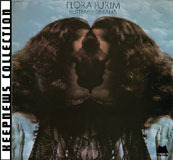 Shortly after, Flora started in earnest to re-educate discriminating musical minds, after linking up with Chick Corea, Stanley Clarke and Joe Farrell to form Return To Forever in late 1971. Two classic albums resulted - Return to Forever and Light as a Feather - nodal points in the development of fusion jazz. When Chick decided to drive further still down the electric road, Flora and Airto chose their own path. Airto by this time had already begun to create his own legend by playing with Miles Davis in 1970, before helping to found the jazz wellspring that was Weather Report. Her first solo album in the US, Butterfly Dreams was released in 1973, which put her right away to the Top Five Jazz Singers on the Downbeat Magazine Fame Jazz Poll. Flora went on to contribute to some of the greatest recording of the seventies - Carlos Santana, Hermeto Pascoal, Gil Evans, Chick Corea and Mickey Hart all benefiting from her vocal and arranging skills. In the mid-Eighties, Flora and Airto resumed their musical partnership to record two albums for Concord - Humble People and The Magicians for which she received Grammy nominations. In 1992 she went one better by singing on two Grammy winning albums - Planet Drum with Grateful Dead drummer Mickey Hart (Best World Music Album) and the Dizzy Gillespie United Nations Orchestra (Best Jazz Album). The launch of the highly combustive Latin jazz band Fourth World in 1991 with Airto, new guitar hero Jose Neto and keyboards and reeds supreme Gary Meek, marked a new era in Flora's career. The band signed to new UK-based jazz label B&W Music - and Flora consciously set out to win over the next wave of listeners. Gigs at the Forum and collaborations with leading UK DJ/producers Gilles Peterson and Patrick Forge led to Flora and Airto as guests on several influential contemporary recordings, including the James Taylor Quartets Supernatural Feeling and Urban Species Listen. Gilles subsequently spent time in the studio remixing Now Go Ahead and Open Your Eyes with help of hot new producer Tyrrell and London session drummer and producer Andrew Missingham. Flora's 1995 world tour started in traditional style with a month a Soho's Ronnie Scott's Club with a new band that includes Gary Brown on bass, Helio Alves on keyboards and regular Fourth World rhythm and psychedelic guitar player Jose Neto, along with Puerto Rico master of congas Giovanni Hidalgo and, of course, Airto, joined Flora to take her new album Speed of Light on the road. Recorded across two continents and featuring some of the top names in contemporary jazz such as Billy Cobham, Freddie Ravel, George Duke, David Zeiher, Walfredo Reyes, Alphonso Johnson, Changuito, Freddie Santiago and Giovanni Hidalgo, the album demonstrates emphatically that Flora is ready to shape the sound of the nineties. With important writing and performing contributions from Chill Factor and Flora's daughter Diana Booker. Speed of Light makes the connection between her experimental beginnings with Chick Corea and Gil Evans and the new head music being produced by jazz players out of the London and New York Trip Hop scenes. Whilst this is certainly music for the head, it is the heart that responds to Flora's extraordinary voice. Open your ears and you will fly. In 2002, with two new releases by Narada Records, the jazzy Perpetual Emotion and the world music Flora Sings Milton Nascimento, once again Flora takes the listeners to the edge of their imagination. In September of 2002, Brazil's President Fernando Henrique Cardoso named Flora Purim and Airto Moreira to the Order of Rio Branco, one of Brazil's highest honors. The Order of Rio Branco was created in 1963 to formally recognize Brazilian and foreign individuals who have significantly contributed to the promotion of Brazil's international relations. The order is named after Barão do Rio Branco, Brazil's Minister of Foreign Affairs from 1902 to 1912, famous for his role in negotiating the national borders of Brazil and referred as the Father of Brazil's Diplomacy. All About Jazz musician pages are maintained by musicians, publicists and trusted members like you. Interested? Tell us why you would like to improve the Flora Purim musician page.